At Rock Creek Sports Club, we believe that a positive attitude, courage and determination are major components when it comes to making big changes — and we have found that member Steven Wright is a role model for all three! So we are very happy to announce that he is our new Member of the Quarter! About a year and a half ago, long time member Steven decided to set a goal. He wanted to get in better shape and start living a healthier lifestyle so he could stick around longer for his kids and grandkids. “I just wanted to be a better me,” Steven says. Steven, who will be turning 65 in November, tells us that he loves being active, and has since he was young. He even went to college on a basketball scholarship! However, as a father of 7 kids – with 5 of them who all went to college at the same time, Steven found himself working two jobs for many years to help make his family’s dreams come true. During this time, his focus on his own fitness took a backseat. With a new outlook, and some changes to his diet and workout routine, Steven proudly tells us he has lost more than 50 pounds! 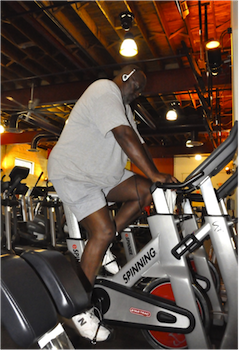 And he’s not stopping anytime soon either, as he has set his sights on a 100-pounds goal! It all started with some work on the elliptical, but it wasn’t long before the Spin classes at Rock Creek started to catch his eye.